The Tiffen 3 x 3" Deep Green #61 Filter is a general contrast filter, primarily for use with black and white film. This dark green filter helps to lighten foliage and other green subject matter within the image while darkening red tones. The #61 filter is also used for tri-color separation and tungsten projection when used in conjunction with a #25 red and a #47 blue filter. This filter is made using ColorCore technology, a process that involves laminating the filter substrate between 2 pieces of optical glass and grinding flat to a tolerance of 1/10,000th of an inch. It measures 3 x 3" / 76.2 x 76.2mm. Deep green tri-color separation and tungsten projection filter when used in conjunction with a #29 red and #47 blue filters. 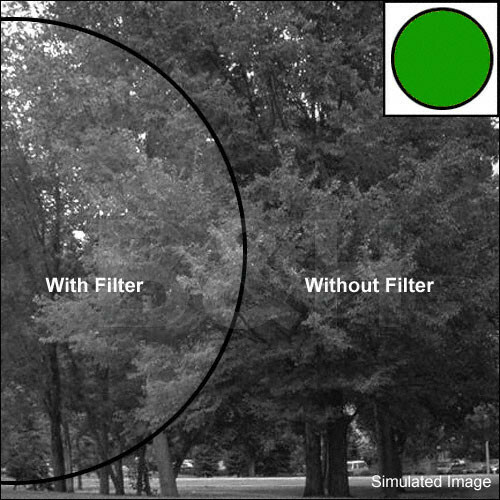 When used over the lens, this filter helps to lighten foliage and other green subject matter within the image while darkening red tones.